As I mentioned in this post, peanuts are very, very nutritious. Peanuts are known for being good sources of monounsaturated fats which make peanuts great for heart health. But I was surprised to learn that peanuts are also a great source of antioxidants. The antioxidants in peanuts rival the antioxidants found in fruits like blackberries and strawberries and surprisingly enough the antioxidant content of peanuts is actually greater than the antioxidants content found in apples, carrots and beets. When I read the article about peanuts being a good source of antioxidants, I thought "good, here's another reason to munch on peanuts" :) Not that I need many reasons to munch on peanuts, since peanuts are one of my favorite snacks. I always keep some roasted peanuts at home and love to grab a handful of peanuts whenever the mood to munch on something hits me:) My friend Akila regularly makes peanut salad for our get together's and I enjoy her version every single time. Since I like it so much I have begun to make peanut salad at home more often. Over time my salad has evolved a little and my version now also included cooked corn and carrots in it. 2 to 3 tbsp finely cut cilantro (coriander leaves) for garnish. 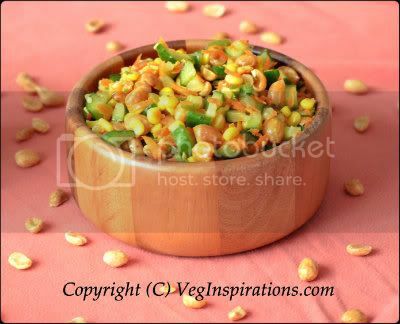 In a large bowl assemble cooked corn, cut cucumbers and grated carrots and mix well. Heat oil in a small pan and add jalapenos to it, when the jalapenos sizzle a little remove and pour this oil+jalapenos on the assembled vegetables. Add peanuts, salt to taste and mix well. Garnish with lemon juice and cilantro leaves and mix well. Keep the salad covered for about 30 minutes or so. Serve chilled or at room temperature.